Homemade Pizza is such an easy meal for during the week, but it also makes the perfect appetizer for game-day, parties, potlucks, and birthday parties. Whatever the event, everyone can get behind a good pizza. Making homemade pizza dough is simple, and it freezes well too, so making it in bulk is a great idea because it’s available whenever you want to make pizza! 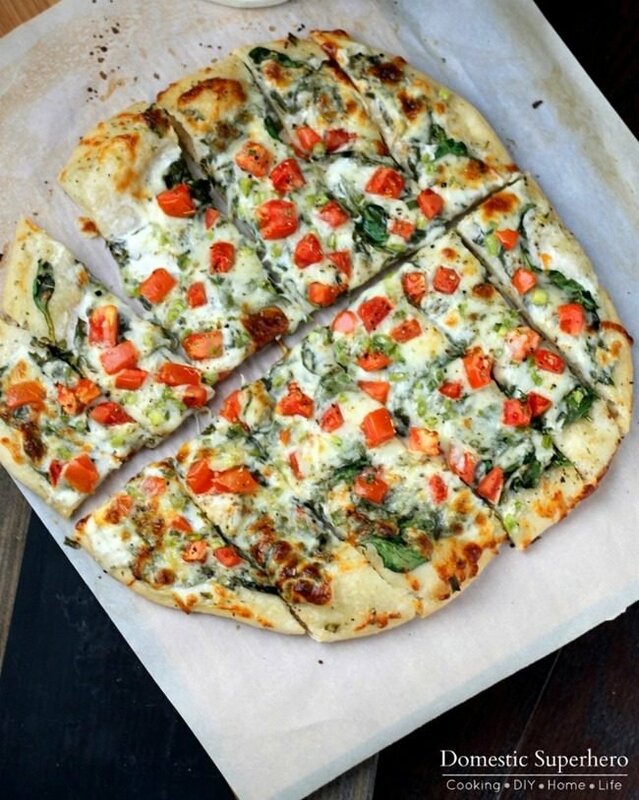 This homemade pizza is loaded with fresh spinach, tomatoes, cheese, and everyone’s favorite- RANCH! This will be your new go-to appetizer or dinner! Decide if you want to use homemade dough or store bought dough – both work great. Preheat the oven and roll out the dough into a pizza shape…or whatever shape looks good! Put it on a pizza stone or baking sheet now (use parchment for a baking sheet). 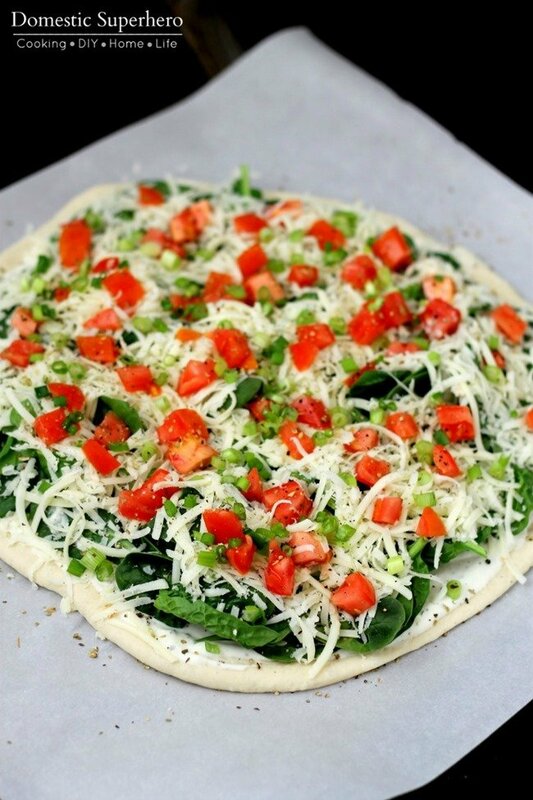 Add the toppings to the pizza– ranch, spinach, cheese, tomatoes, green onions, and spices. Place pizza into the oven, and cook for 12-17 minutes. Check at the 12 minute mark, and assess if it needs to be cooked longer. I like my cheese to be browned and bubbly, so I usually cook for about 15-16 minutes. Just keep an eye on it. Remove carefully from the oven, and let the homemade pizza cool for about 10 minutes. Cut in slices or sticks and serve with a side of homemade ranch. 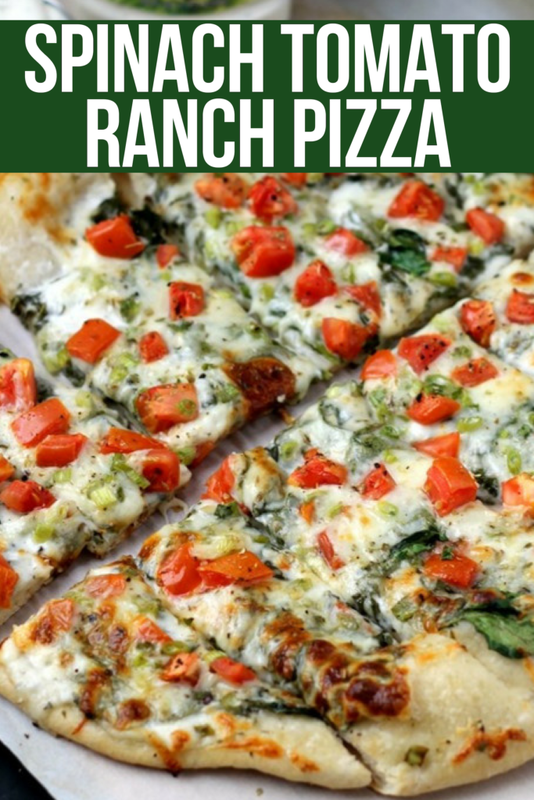 I love this cilantro ranch and jalapeno ranch with this homemade pizza! Can I use Gluten Free Crust or Cauliflower Crust for this recipe? YES! You can use GF crust or caulifower crust (lower carb option) for this recipe with great success. For Gluten Free Crust: Make homemade GF dough, then pre-bake for 8-10 minutes. Next, top with toppings, and bake for 12-15 minutes or until bubbly. For Cauliflower Crust: Make the cauliflower crust following these directions. Bake for 20 minutes first, then add toppings and bake an additional 10 minutes or until bubbly. 3 Herb Garlic Cheesy bread is the easiest party appetizer ever! The kids will love it! Spinach Artichoke Flatbreads are an easy weeknight meal that put everyone’s favorite dip on a homemade or store-bought naan bread. Southwest Pizza is loaded with beans, corn, tomatoes, red onion, and a lime cream! Mushroom and Goat Cheese flatbreads are topped with delicious sautéed mushrooms, creamy goat cheese, and a delicious balsamic reduction. Preheat oven to 400 degrees. Roll out dough into a pizza shape (square or round-whatever you want!). Place pizza dough onto pizza stone or baking sheet (parchment paper for easier cleanup). Top pizza dough with ranch dressing, using a spatula or spoon to spread evenly. Then add spinach, cheese, tomatoes, and green onions. Add a couple cracks of black pepper and a few shakes of dried oregano over the top. Place pizza into oven and bake for 12-17 minutes, checking after 12 minutes. The cheese should be browned and bubbly, and the dough cooked through. Continue baking if needed - mine is usually perfect around 15 minutes but ovens vary. Remove from oven. Let cool 10 minutes and then slice and serve with a side of ranch for dipping! I love the idea of using ranch on there. It sounds super tasty! I use ranch and Italian dressing on lots of stuff. Never have used ranch on pizza. I will have to do this one. I’ve never tried ranch on pizza, but I think I would like it. YUM! I love ranch, and pizza, esp salad pizza so this is a WIN for me! I <3 it! 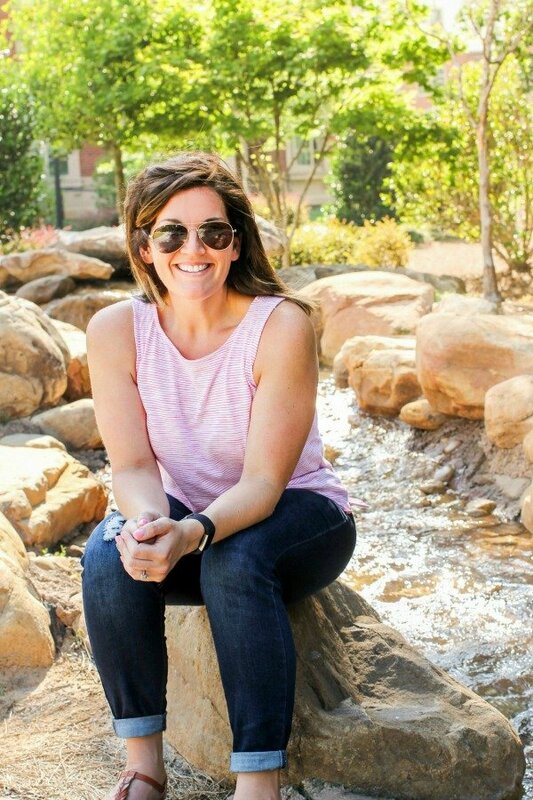 Thank you, Allyson. Oh, yum! Your photo made me instantly hungry. Now if only I could reach through my screen and grab a slice. This looks amazing, Love new spins on pizza! Wow this looks amazing! We make homemade pizza often so I’ll give this a try soon! WOw What A New & Great Twist To Pizza Looks Sooooooo Yummy Can’t Wait To Try! I would have never thought of adding dressing to my pizza, what a great idea! Looks and sounds amazing! I never thought of this kind of pizza. But my house loves pizza of all kinds. This looks really yummy! 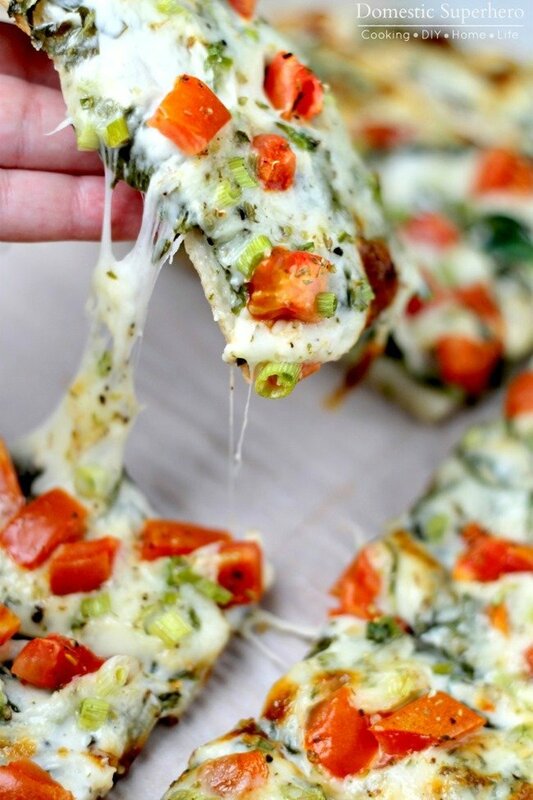 What a great twist on pizza! Can’t wait to make this! what a fun way to mix up pizza night. I will have to put this in our routine, I just opened a new bottle today. Those would make great party appetizers, I would think! It looks delicious! This looks so yummy! My kids love ranch dressing as a veggie dip, so this could go over really well. OMG…this looks delicious! I love to try different pizza’s. Ranch is Isa’s favorite dressing! Seriously???? Great shots. The cheese pulling one is killer. Who would EVER put ranch dressing on pizza??? I’m so doing this. Thanks. Looks fantastic- I have got to try this!! This would be so fantastic for game night! Wow I loved this pizza so much! My kids asked me to make it again and they NEVER eat spinach! We’ve been on a pizza kick lately. Excited to try this one! Oh my, this pizza sounds amaazing!! I LOVE the ranch flavor!! YUM!! We love to make pizza at home! This is a great idea to make with tomato and spinach! This pizza looks AMAZING!! Saving! I never thought about putting ranch on my pizza and now I am obsessed with trying this! pizza, it looks so good! Totally drooling over this, it looks delish! I love this type of pizza at restaurants, but I’ve never made it at home. Adding it to the menu! This looks beyond yummy! My family would go crazy for this, love it! This looks so flavorful and delicious! Yum! This is such a fun flavor combination! Great way to change up pizza night! Really unique ingredients that seem to fit so well together! Perfect for pizza night! Yum! It looks really flavorful! Would love to give this a try!